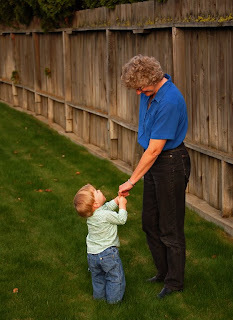 My mom came down yesterday just to be with her grandson. (well, and me too, but mostly him!) He's 13 months old today. 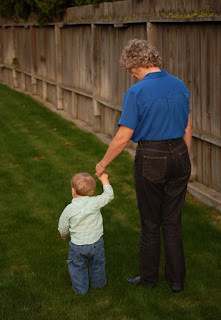 He doesn't know how blessed he is to have his grandma, who adores him, living so close. He giggled like crazy when she came in the door. I think that adoration feeling must be mutual! We went outside to take some photos and satisfy this crazy idea I had. He's just learning to walk and I wanted to get some of him walking. My ideas never seem to turn out exactly the way I'd pictured, but at least I got some cute photos. I'm blessed that my mom is so close by and wants to spend time with me. Some days my son drives me crazy and I'm sure I did the same to her, but she still loves me, maybe even more now, if that's possible! This year will be my second Mother's Day, just barely! My son was dedicated on Mother's Day last year at only 6 weeks old. I didn't have a clue then what I was getting myself into... and probably still don't! All I know is, he's stolen my heart completely. Maybe now I understand, just a little bit more, what my mom has done for me all my life. So, thanks, Mom. And Happy Mother's Day! This post (specifically the first picture) is entered in Mother's Day contests at 5 Minutes for Mom, Are We There Yet Mom, From Dates to Diapers, and Mommies United. I love it. You can never get enough pics of moms and their babies/granbabies. grandmas are the best!! cute pictures!! Beautiful capture! You can just see the love in his eyes for his grandma. Thankyou for sharing your lovely photo. Good Luck! Great post! We are very blessed to have Mimi (my Mom) close by... She is such a wonerful grandma! (Make sure you come by From Dates to Diapers for another chance to enter your fabulous post! I love hand holding photos. Good luck! Thanks for the tears of joy!! Loving you ever so much! Congratulations on winning one of the San Disks, from Mommies United! Please provide us with your mailing address and which Sandisk color preference you have.